I remember the first day I played Malzahar. I said I would never drop money on this game… and then Swain and Malzahar went on sale in the same week. Damn you, Riot! Malzahar is probably my favorite mid champion. He’s pretty easy to get used to, what with Malefic Visions returning mana when it’s on a dying enemy; he harasses incredibly well because it freaking bounces if something dies with it on them; and he’s the closest we’ve got to a pet-based character. Nothing is quite as satisfying as having two voidlings out, either. So let’s talk abilities. Malzahar’s passive is probably what makes him so fun and deadly. Every four casts, he gets a voidling which homes in on whatever’s affected by Malefic Visions. You can usually surprise people by dropping Visions on something near-death, then waiting for it to bounce to them and getting a voidling out. If you get a few early game items, that’ll usually take out about half their health, depending on how long it takes them to react. Malzahar’s Q, Call of the Void, is the one spell I almost never use. I’m sure it’s perfectly fine, but it’s a hard-to-aim ability that you’re really only using for the silence. Maybe it’s because I’m just bad at throwing it out, but I’ve never seen it make much of an impact. Because of this, I always get it last. Null Zone, however, is probably one of my favorite spells. It makes for excellent comboing with his ult and can help burn down bigger targets like nothing. Malefic Visions has already been discussed with his passive, so I’m going to skip that and just say that I always max it first. Once maxed, it does an insane amount of damage, especially if you’re ahead. Malzahar’s ultimate, Nether Grasp, is definitely the most often poorly-used spell in the entire game. The thing about Nether Grasp is that it doesn’t really work unless you can throw out a full combo. It just doesn’t do enough damage without Null Zone and Malefic Visions to be worth using it just for the suppression. As far as building goes, I take a pretty basic mana-using AP carry setup for runes and masteries. In terms of items, it’s the one build I know by heart: I start with boots and potions. Depending on how well I’m doing by the time I have to go back, I either invest in two Doran’s Rings or a Needlessly Large Rod. If I get a rod, I then finish up Rabbadon’s Deathcap. If I get the rings, then I start on Deathfire Grasp with Kage’s Lucky Pick. I keep the Pick for a while, then invest in the Deathcap. Deathfire Grasp is usually a luxury item, but I tend to get it earlier than normal if I’m too far behind to get a Deathcap. As far as super late-game goes, I get Rylai’s Crystal Scepter for bonus survivability and the slow. Despite being one of my favorite champions, he does have some problems. My biggest problem is that, if you try to Ignite during Nether Grasp and you’re out of range, Malzahar will break the channel and move within ignite range. Same thing if you click the ground accidentally. It feels like Riot should implement a way that, like Galio’s ultimate, you should be able to hit R again to cancel it. My other problem with Malzahar is that his voidling occasionally goes ‘dumb.’ It will kill something, then just stand around for a bit until it’s ordered to kill something else (via Malefic Visions) or dies. It’s less noticeable than Yorick’s ghouls because the voidling can be ordered. So yeah, Malzahar is, like, six and a half kinds of fun, especially if you like playing mid. The fact that his IP cost dropped helps him be more affordable. There’s a bit of a learning curve involved with his ultimate and he pushes like a madman, but Malzahar was definitely my best purchase. Anyhoo, that is me done for the day. Looking Back: Kirby’s Dreamland 2 is coming tomorrow, so check that out if you’ve liked the series so far. As always, thanks for reading and have a good’un! 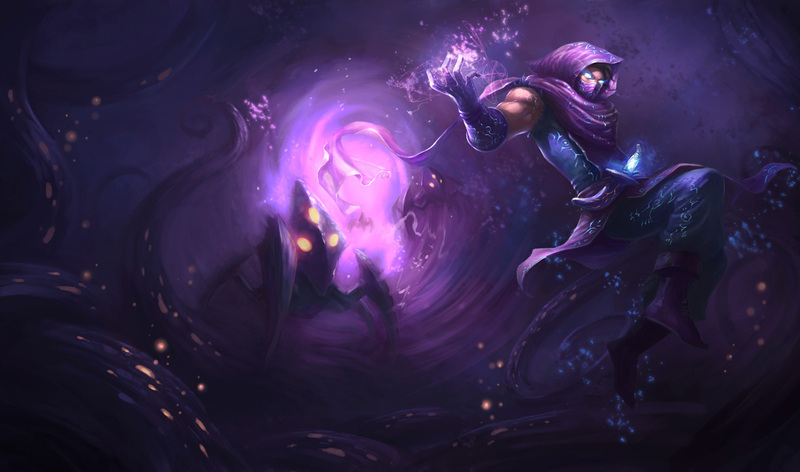 This entry was posted in League of Legends, Video Games and tagged league of legends malzahar, malzahar impressions, malzahar review, malzahar the prophet of the void. Bookmark the permalink. Guy’s probably got the best reliable early-game strengths out of all the mages. He doesn’t /need/ his ultimate to get you out of lane, he just needs you to be dumb and stand by the dying minions.